Our mission is an important one. We seek to marry entertainment with education. This will be an event like no other. You are invited to join us November 3rd at the Philadelphia Insectarium. For less than the cost of admission, you and your guests can explore the entire museum. With every ticket purchased, we will make a donation to one of our featured charities on your behalf. We have a custom curated oddities flea market for you to find a treasure. Our entire second floor has been designated as our oddities ink tattoo parlour where you will be able to grab a custom flash piece by some of the industry's most talented artists. Downstairs, in our classroom, we will have some of the most affordably priced classes around. Be sure to book in advance. Periodically throughout the day, guest presenters will be doing free presentations and giveaways about some of the most fascinating topics in science today. Stay tuned for more info. We cannot wait to see you there! Check out our Facebook and Instagram to keep up with upcoming performance, vendor, and workshop announcements as we build up to our inaugural event. The Philadelphia Insectarium is a Children's Museum. All live animals, be it service or otherwise, must be pre-authorized by event staff. 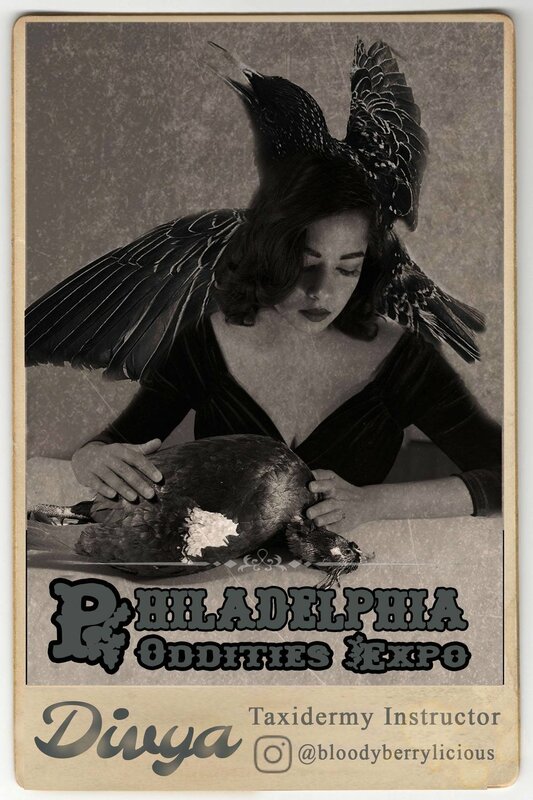 Please contact info@philadelphiaodditiesexpo.com for information. The second and third floors are accessible by stairs only. We apologize for the inconvenience. The Butterfly Pavilion is humid; outdoor areas are subject to the weather the day of the event. Plan accordingly. o2. Be Respectful. This means respecting the museum, other attendees, others' belongings, and staff. 03. Children must be supervised at all times. 04. No rough-housing or running on venue property. 05. Be mindful. Do not block traffic flow in high-traffic areas of the museum. Be patient on the stairwells. Do not overcrowd performers, instructors, or museum exhibits, especially those with live animals. POE staff reserve the rights to remove any party from the event without exception for any reason. This decision is discretionary and based on our guidelines of approved behaviors. 01. No video is to be taken at this event. 02. Do not photograph anyone without their prior consent (this does not apply to people in crowds). Use good etiquette when requesting consent for photographs. 03. Be courteous and mindful when using flash photography. Animals at the museum may be startled. Performers and instructors may become distracted. 04. Avoid blocking main throughways to take photographs. 05. Professional photographers: please email us at info@philadelphiaodditiesexpo.com for a press pass. We reserve the right to ask for the removal or deletion of any media taken from our event without permission. General admission attendees receive a wristband good for entrance into the museum for the duration of the event and a POE token worth $1 to donate to one of the featured charities. Children under 12 receive a wristband good for entrance into the museum for the duration of the event. All children must be accompanied by an adult. Attend Divya Anantharaman's rat taxidermy workshop, running from 11am - 5pm. Periodic intermissions will allow students a chance to rest and explore the museum. Dissect your very own owl pellet and learn about the biology and diet of one of natures most iconic predators! You will spread and pin one of a variety of fascinating insects in a glass-fronted frame that you get to take home that day. Classes run from 12pm-2pm and 5:30pm-7:30pm. 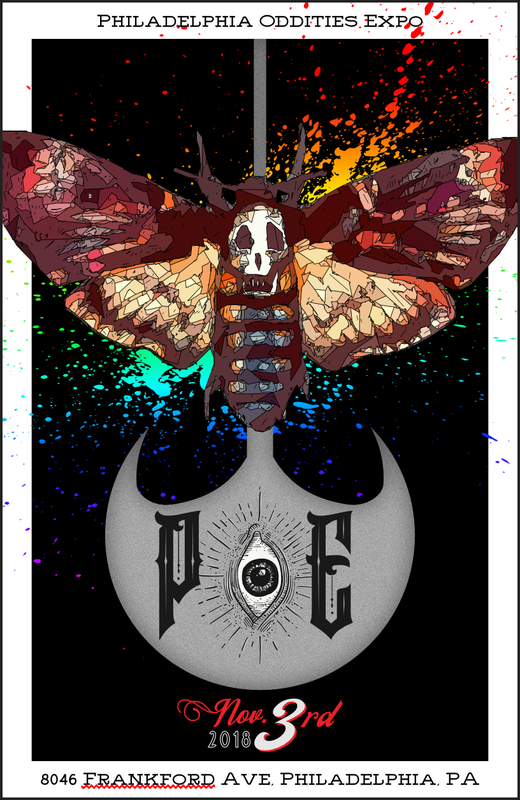 With every ticket purchased, you will be given a POE token, but feel free to buy more. Each token is a $1 pledge towards any one (or more) of these fine charities. Put your token where it means the most to you, or whoever needs it the most at the time. Pinups for Pitbulls, Inc. (PFPB) was founded in 2005 by Deirdre ‘Little Darling’ Franklin. Deirdre was tired of finding that so-called rescues and shelters were euthanizing healthy, friendly, and adoptable animals due to their alleged “breed,” and so she utilized her background in modeling and education in fine arts to create a calendar like no other–eye-catching pinup girls and their pups, paying close attention to detail and era appropriate style along the way. Since 2005, PFPB has continued its progress and has grown exponentially into the internationally recognized organization it is today. Deirdre’s initial vision and mission has remained intact, however her passion for animals and her ability to capture an audience has enabled PFPB to reach people across the world. Through Deirdre’s ever-growing team of volunteers in over twenty states, PFPB has been able to host educational seminars, community outreach initiatives, and fund-raising events throughout the United States, Canada, and even reaching to Europe. In its educational crusade, PFPB hopes to end discrimination, abuse, and the unnecessary killing of pit bull-type dogs around the world–all the while dreaming that one day, PFPB will no longer be needed. Philadelphia Metro Wildlife Center (PMWC) was founded in 2018 and brings together a team of two wildlife rehabilitators with over 30 years of experience treating injured and orphaned wildlife, and over 60 volunteers who help to care for animals 365 days a year. As part of our mission, we use unreleasable wild animals as our "ambassadors" to allow the public to discover the beauty of Pennsylvania wildlife up close and to encourage them to become responsible stewards of their environment so that these species will remain healthy for generations to come! Operation Monarch is the non-profit run by the Philadelphia Insectarium and is dedicated to educating the public about the population decline of the monarch butterfly. We provide educational programming to schools and local residents that focus on the current threats to this important species and what can be done to help. Operation Monarch also coordinates several community milkweed planting projects and conducts research on how to optimize planting programs to help create pollinator habitats. Donations go towards supporting these educational programs. America’s finest museum of medical history, the Mütter Museum displays its beautifully preserved collections of anatomical specimens, models, and medical instruments in a 19th-century “cabinet museum” setting. The museum helps the public understand the mysteries and beauty of the human body and to appreciate the history of diagnosis and treatment of disease. Your money will go towards the conservation and preservation of our amazing anatomical specimens. Some of the museum objects are very old and require constant upkeep and restoration. Our staff works daily to preserve this historical collection, and we need your help! Founded in 1999, ALS Hope Foundation is an independent non-profit located in Philadelphia, PA. The Foundation is committed to the care and cure of people with ALS, a fatal neurodegenerative disease that robs a person of their ability to walk, eat, speak and eventually breathe. There is currently no known cure. But there is hope. The Foundation supports the MDA/ALS Center of Hope at Temple University Hospital, an ALS clinic that provides multidisciplinary care free of charge. The Center of Hope is committed to providing the highest level of care possible so that PALS can live their best lives and maintain independence for as long as possible. While ALS Hope Foundation is relatively small, the impact is great with all funds raised going to services and programs directly benefiting PALS as well as educational and research initiatives. This is made possible through the generous support of individual donors and community partners. Together, we can fight to defeat ALS and provide the highest level of care for families living with the disease. Education? Entertainment? You won't be able to tell the difference. A unique combination of science and style, Divya Anantharaman is New York City's premiere taxidermist. An award winning licensed professional preserving animals with honor and compassion, she recently took a Best of Show at the 2018 New England Taxidermy Competition, and is the coauthor of the book "Stuffed Animals: A Modern Guide to Taxidermy." Her specialties are birds, small mammals, and anatomic anomalies. She left the world of corporate fashion to pursue her love of natural history as the resident taxidermist at the Morbid Anatomy Museum, and has built a following creating taxidermy, skeletal, and entomology displays, along with jewelry and wearable art, for anyone who finds wonder in the natural world. In her commitment to conservation, she regularly works with various organizations like the Audubon Society, and volunteers as a rescuer/rehabber. She is a board member of the New England Association of Taxidermists, and her clients include museums, art galleries, and private collectors. Though her passion is demystifying taxidermy for curious clients through workshops and lectures. She takes great pleasure in seeing students progress as they expand on the skills learned in class, and enjoys connecting people with taxidermists as a positive and welcoming community. Her classes are designed to make the world of taxidermy accessible to absolute beginners, whether your interests are scientific, artistic, or something in between. All animal parts are legally and sustainably obtained. Scott Kirkland is an anthropologist, focusing on the cranial and skeletal comparative anatomy. His specialties are human variation, human identification, and comparative mammalian osteology. His work focuses on understanding human variation, and why human crania differ between populations. He has 12 years of experience in teaching osteology and anthropology to children, college students, and the public. He is passionate about sharing his knowledge of osteology and exposing students of all ages to the wonders of human variation. Through his classes he aims to demystify the world of osteology as well as dispel the pseudoscientific aspects of human classification. HIs students explore the ways in which humans are different, why they are different, mortuary practices, and what we can learn from studying human crania. His classes are designed to be accessible to all individuals. Find your treasure in the bazaar! Purveyors of the peculiar, artisans of the odd. Our custom curated mini Marketplace will feature some of the finest wares around. With everything from science to fashion, there will be treasures here not to miss. Are you a vendor? Would you like to join us? Fill out our application today. Jessi Hardesty is an anxious mark maker who fixates on characters and objects that explore identity, longing, communication, and escapism. Masked figures, fictional characters, and other manifestations of persona intermingle and appear repeatedly in her graphic works and drawings. By exploring the constant tension between reality and fantasy, her work can question the contemporary curation of persona and obsession with the otherworldly. She is able to channel and address concepts of spiritualism, ephemera, and technology via the ritual labor of carving and printing. She returns always to woodcut as the main vehicle for her creations, being drawn to the decisive nature of the carved mark. Artemis Apollo Jewelry creates one of a kind jewelry in copper, silver and gold. All of the jewelry is wire wrapped and forged by hand. The items range from intricate beaded pieces to wire wrapped bones and skulls. Outlaw Candy is a one woman operation inspired by vintage, rock and roll, the Southwest, and love of strange and unique things. Formerly an art teacher who took summer road trips, travel and adventure have inspired all the artwork. Yarn painting is a native Mexican tradition used as a form of mediation. The ‘original’ spiked punk skulls were acquired in South Dakota and inspired by Damien Hurst. April was born right outside of Baltimore, MD. She is a self taught artist and has been painting and drawing since she could hold onto a brush. Her favorite things to draw are people and ideas. She also greatly enjoys drawing foliage, animals and personifying otherwise everyday objects. She draws inspiration from emotions, colors, movement — basically life. Sponsored by Tiki Tiki Games there will be several tables of games. Pull up a chair and enjoy a game. Everything from Cards Against Humanity to Oujia boards. Internationally renowned artist Gus Fink and Emi Boz will be joining us selling their extensive line of plush toys, prints and even a brand new board game you can try out at the Tiki Tiki tables. Check out the amazing sponsors of our prizes, giveaways, and performances!